During this year’s Finding Faith Tour, VOX editor Ruth Garvey-Williams met up with Simon Marriott who heads up Youth for Christ Ireland. 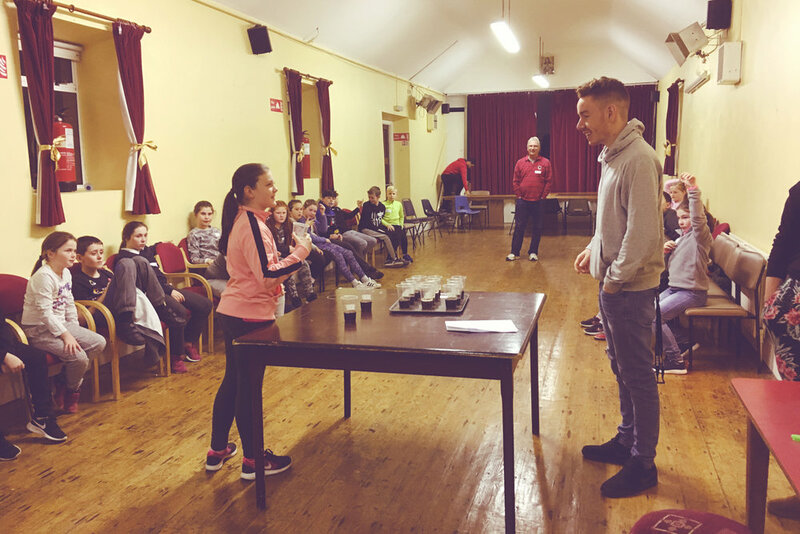 She found out what brought this graphic designer from Northern Ireland to Mullingar and the heart and ethos that shapes the work of the dynamic YFC team. This whole experience freed me up to champion other people to be the person they were created to be. Within a year or two, we walked away from my successful business and joined Youth for Christ in the Czech Republic, running camps for children and young people from orphanages. I had just been through an experience in which I had almost lost my son. I could not understand why any parent would choose to give their child away. WHAT CHANGED WHILE YOU WERE IN THE CZECH REPUBLIC? It gave me a wider perspective. I learnt to stop deciding where God wasn’t working (because of my own pre-conceptions) and instead to be observant to see what He is doing. Living in the Czech Republic, it was easier to say that I’m from Ireland rather than I’m from Northern Ireland. People there couldn’t care less which part of Ireland we were from. It made me recognise that I was more Irish. I realised that in my time in the Czech Republic, God was preparing me for Ireland. If I had come direct from the north, I would have been a fish out of water. I would have reacted arrogantly without even knowing it. But to live in a different context, to have those edges knocked off and to be humbled, prepared me to come here with that posture of humility. WHAT WERE THE FIRST STEPS? There is a lot of imagery around igniting fires and passing on the torch until all of Ireland is illuminated. We believe that God is ushering in a new season. I suppose the vision that God has given me for Ireland is to see “fires” started, becoming beacons of hope across our land. We need a posture of humility. God is at work and we are trying to observe what He is doing. Over the last three years, He has opened doors for us. For me, coming to Mullingar was a strong sense of coming home. I don’t even see my role as a missionary but as a job I have in which I get to share the gospel with young people. We started working in one school and, as a result, we were invited into a local parish. From there we had an opportunity to be involved in mentoring and then got involved in community projects. Eventually, we got to the point where we wanted to have a place where young people could come and go and so we opened our drop -in centre - the Upper Room. This is a place to model what family life looks like - a place where we can talk to one another about issues like drugs or relationships that have gone sour. As well as the games room, we have a quiet room where we pray and if the young person would like to, we can pray with them. HOW ARE YOU SEEING AN IMPACT ON THE LIVES OF YOUNG PEOPLE? We do mentoring in schools. We seek to stand in the gap for young people. Our heart is that they encounter Jesus, but we are not going to force that on them. One in four families in Ireland with children are single parent families, of which 86% of dads are absent in some way. When I get to speak to a group of young people, I feel the Father heart of God. I’m just trying to point them to Jesus to encounter the Father. These young people are heavy on my heart. They are searching for something. Many are looking for deeper conversation. That is what I enjoy about youth work. I don’t do superficial. So I can ask, “How are you really?” And that is when we need to listen well! We start to see young people flourish because they have had the ability to talk about the things that matter most and they are seeing how Jesus can help them. It is a privilege to journey with young people and it is certainly a two-way street. I was telling some young people, “Faith is like a gym membership. If you have the card in your wallet, it is not going to transform your abs! You need to train and be active to become fit. An active faith should transform your life, head and heart.” We are trying to model something real. I have experienced the love of God through Jesus and that is what I seek to share with the young people. To find out more about the work of Youth for Christ Ireland, visit www.yfc.ie.